WASHINGTON (Reuters) - Chinese telecoms giant Huawei Technologies Co Ltd's chief financial officer was arrested as part of a U.S. investigation of an alleged scheme to use the global banking system to evade U.S. sanctions against Iran, according to people familiar with the probe. 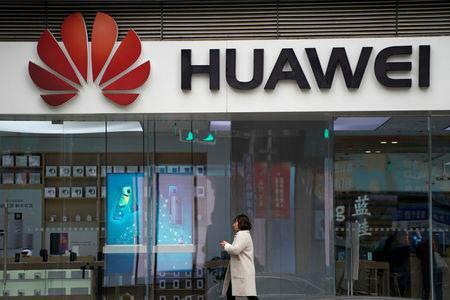 The United States has been looking since at least 2016 into whether Huawei Technologies Ltd violated U.S. sanctions against Iran, Reuters reported in April. More recently, the probe has included the company's use of HSBC Holdings Plc to make illegal transactions involving Iran, the people said. Huawei CFO Meng Wanzhou, daughter of the company's founder, Ren Zhengfei, was arrested in Canada and faces extradition to the United States. The news roiled global stock markets on fears the move could escalate the Sino-U.S. trade dispute. In 2012, HSBC paid $1.92 billion and entered a deferred prosecution agreement with the U.S. Attorney's office in Brooklyn for violating U.S. sanctions and money-laundering laws. A spokesman for the U.S. Attorney's office in Brooklyn, which Reuters has reported is investigating Huawei, declined to comment. Stock markets around the world tumbled on Thursday on fears actions against Huawei could derail talks to resolve the trade dispute between the world's top two economic powers, whose tariffs have disrupted the flow of hundreds of billions of dollars' worth of goods. HSBC's U.S.-listed shares initially fell as trading volume rose, dropping as much as 6 percent after Reuters reported the bank's link to the case. They were subsequently down 4.6 percent. Huawei is already under intense scrutiny from Washington and other western governments over its ties to the Chinese government, driven by concerns it could be used by Beijing for spying. It has been locked out of U.S. and some other markets for telecom gear, but has repeatedly insisted Beijing has no influence over it. Meng, one of the vice chairs on the company's board, was arrested on Dec. 1 at the request of U.S. authorities and a court hearing has been set for Friday, a Canadian Justice Department spokesman said. U.S. President Donald Trump and Chinese President Xi Jinping had dined in Buenos Aires on Dec. 1 at the G20 summit. Canadian Prime Minister Justin Trudeau on Thursday said his government had no involvement in the arrest of Meng, who was detained while changing planes at Vancouver airport. Trudeau told reporters that Ottawa had been given a few days' advance notice about the planned arrest, but declined to give further details, citing an upcoming bail hearing. Trump's national security adviser, John Bolton, said in an interview with National Public Radio that he knew in advance about the arrest, but a White House official said Trump did not know about the Huawei extradition request before his dinner with Xi in Argentina. Chinese foreign ministry spokesman Geng Shuang told a daily briefing on Thursday that China had asked Canada and the United States for an explanation of Meng's arrest, but they have “not provided any clarification." Republican U.S. Senators Ted Cruz, Marco Rubio and Ben Sasse welcomed the arrest, saying the Chinese tech giant posed a security threat. Cruz tweeted: “Huawei is a Communist Party spy agency thinly veiled as a telecom company." The probe of Huawei is similar to one that threatened the survival of China's ZTE Corp, which pleaded guilty in 2017 to violating U.S. laws that restrict the sale of American-made technology to Iran in efforts to curb Tehran's missile and nuclear programs. ZTE also paid a $892 million penalty. Earlier this year, the United States said ZTE made false statements about disciplining some executives responsible for the violations, and banned U.S. firms from selling parts and software to the company. After ceasing major operations as a result, ZTE paid another $1 billion as part of a deal to get the ban lifted.